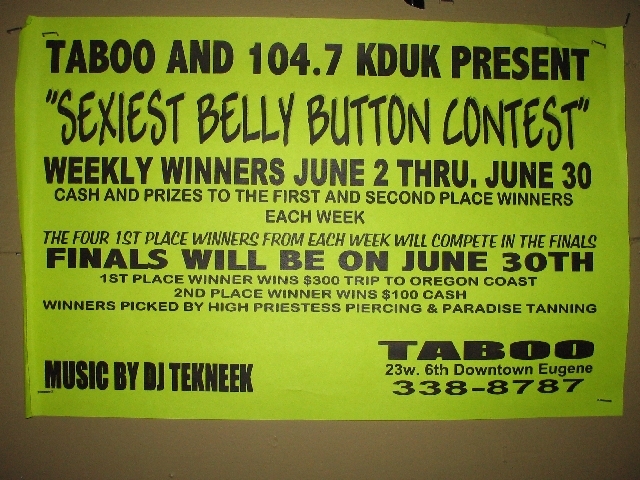 The taboo is a great rock club in Eugene. The gig, however, was not the triumph it could have been. The attendance was the worst we’ve experienced so far. We all played well. A couple of things that stand out about this gig are me stopping mid solo spot in the instrumental ‘My Romance’ to tell a couple of guys near the front of the stage to be quiet. My request was backed up by several members of the audience – after that little exchange my solo spot felt a lot more intimate! The other thing is that, during Carl’s drum solo, I got off stage and went out through the audience to the public toilet (or rest room as they call it over here). I had a chat with a few of the guys in the rest room and then went back to the stage through the audience in time to see the end of Carl’s solo and finish ‘Fanfare’ with him and Stuart. Up in the dressing room area there were two push bikes – great fun… apart from the odd press-up (or push-up), this was probably the most exercise I’ve got all tour. Novel though it maybe, I don’t expect that indoor cycling will catch on.